Presented By Heads Up Plant Protectants, Inc. Looking to gain an edge on Soybean Sudden Death Syndrome and White Mold going into 2019? For less than $4/ac your seed dealer can provide enhanced protection against SDS and White Mold, only with Heads Up Plant Protectant. Above: Heads Up® Plant Protectant vs Untreated Soybean Trial – Clark Lake, IA 2018. Dark patches exhibiting early die down caused by Soybean Sudden Death Syndrome. Heads Up® treated beans had a +3.9 bu/a increase over untreated in trial. Trial conducted the Iowa Soybean Association through the On-Farm Network. Heads Up® is an EPA registered biological seed treatment that offers broad spectrum disease protection against soybean diseases such as White Mold (Sclerotinia sclerotiorum), Sudden Death Syndrome (Fusarium virguliforme) and Rhizoctonia (Rhizoctonia solani). Non-fungicidal, Heads Up® utilizes systemic acquired resistance, or S.A.R., as a new mode of action which works to trigger key crop defense pathways upon germination. 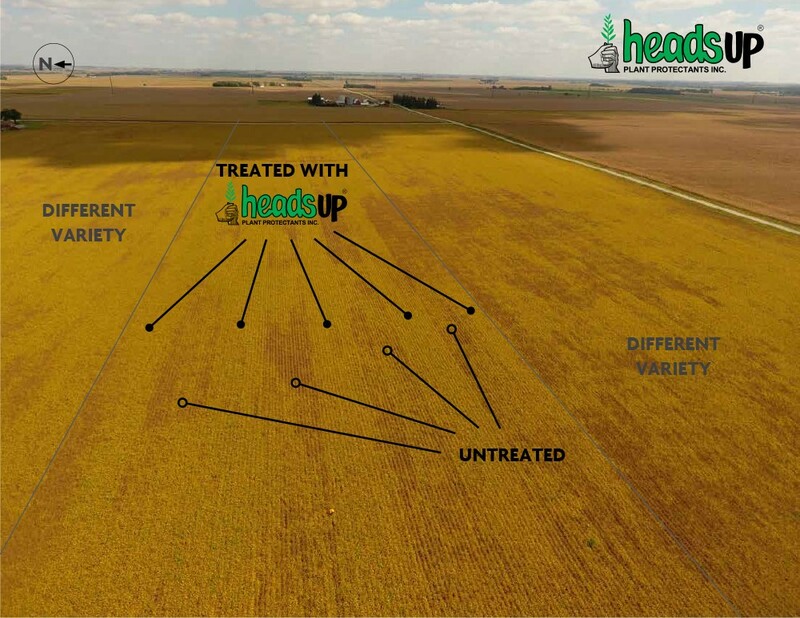 By eliciting known defense pathways prior to disease infection, Heads Up® works with the variety to kick-start varietal resistance for a systemic, season long effect. Heads Up® is compatible with other seed treatments and inoculants; and can be paired with other products to offer a wider range of disease protection than traditional fungicides seed treatments alone. The product has a long shelf life and there are no-restrictions between treatment and use. While being biological in nature, Heads Up® is manufactured from highly concentrated plant extracted biochemicals. The product does not contain any living organisms and is safe to the user. Concerned about White Mold in your soybeans? History of Sudden Death Syndrome in your soybeans? Albaugh LLC, Wilbur Ellis, Helena Agri, Direct Enterprises, Unified Ag Solutions, Pulse USA, Rosen’s, WinField United, Growmark and Integrated Agribusiness Professionals.